The 2014 CR-Z goes on-sale tomorrow, combining sleek styling, numerous standard features and sporty handling while maintaining terrific fuel efficiency. 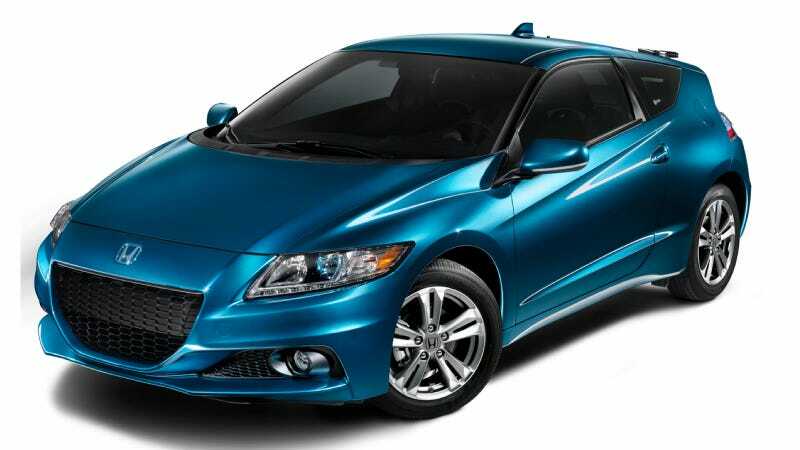 The CR-Z was thoroughly updated for the 2013 model year with a more powerful battery pack, increased power and styling improvements, while also earning a TOP SAFETY PICK rating from the Insurance Institute for Highway Safety (IIHS). For 2014, the CR-Z remains the only hybrid vehicle offered with a sporty manual transmission. Two models are available, the standard CR-Z with a starting MSRP of $19,9952, and the feature-rich EX with a starting MSRP of $21,8402. Both models come equipped with a standard 6-speed manual transmission or an available CVT. Additional standard features on every new 2014 CR-Z include Bluetooth® HandsFreeLink®, Bluetooth® Audio, rearview camera, an Expanded View Driver's Mirror, AM/FM/CD/USB audio system with six speakers, automatic climate control, power windows and door locks, remote entry and cruise control. View, build and price a 2014 Honda CR-Z at http://automobiles.honda.com/cr-z. The hybrid powertrain uses a 1.5-liter 4-cylinder, 16-valve, single-overhead cam (SOHC) engine with "intelligent" Variable Valve Timing and Lift Electronic Control (i-VTEC®) that receives additional power from the Integrated Motor Assist (IMA®) system's DC brushless electric motor. Powered by a 144-volt Lithium-Ion battery pack, the 15-kW electric motor assists in acceleration and also acts as a generator during braking or coasting to capture kinetic energy and recharge the battery. Combined peak output is 130 horsepower at 6000 rpm and 140 lb-ft. of torque (127 lb-ft. on CVT-equipped models), including electric-motor assist (all figures SAE net). Refreshed with exterior design and trim upgrades for 2013, the CR-Z's "one-motion" exterior wedge shape begins at its low-slung hood to form a broad forward stance, with its deeply inset beltline adding a dynamic element. Standard exterior features include power windows and door locks, remote entry, and an Expanded View Driver's Mirror. The up-level CR-Z EX model adds LED daytime running lights (DRL), High-Intensity Discharge (HID) headlights with Auto-On/Off, and fog lights. Front MacPherson strut and rear H-shaped torsion beam suspension, along with electric power-assisted rack-and-pinion steering (EPS), are tuned to provide a sporty driving experience. All CR-Z models have 16-inch aluminum wheels and 195/55R-16 tires, and larger 17-inch alloy wheels with 205/45R-17 tires are available. The CR-Z’s low height, compact wheelbase and placement of the battery and other hybrid components beneath the rear cargo area contribute to a low center of gravity and responsive, sporty handling. The CR-Z interior has a high-tech appearance and intuitive controls. Its ultra-modern instrument panel features gauges that illuminate with a three-dimensional color theme for a multi-layered appearance, with the tachometer backlighting color changing based on driving style. The sweeping upper dashboard shape creates a wraparound cockpit environment. Premium sport-oriented seats provide firm lateral support along with everyday driving comfort. A console behind the front seats optimizes cargo space, with a hard-shell separator that can be closed to create additional hidden storage. The 2014 Honda CR-Z is covered by a 3-year/36,000-mile new-car limited warranty, a 5-year/60,000-mile powertrain limited warranty, and a 5-year/ unlimited-mile corrosion limited warranty. A 15-year/150,000-mile emissions warranty also applies when the vehicle is registered and normally operated in California and certain states that have adopted California Zero-Emission Vehicle regulations.